Gotz Hannah Hair Stylist is 50cm tall and has beautiful long blonde rooted hair. She has in-set blue eyes, long dark eyelashes, blushed cheeks and lips. She has a full vinyl body with joints at the shoulders, hips and neck. Her face is asymmetrical and so are her limbs which makes her particularly realistic. Gotz moulds are designed with a degree of asymmetry to make dolls look more real, as a reflection of the fact that in reality people are not symmetrical. Hannah is a location hair stylist, perhaps on a film looking at what she's wearing. She's in comfortable, warm stylish clothes and looks ready for action. Hannah is wearing an orangey-red sleeveless quilted body-warmer. It has popper fastening and and elasticated belt with a silver metal clasp. Under this she wears a fine knit orangey long sleeved sweater with a large cowl neck. She wears dark denim jeans and silver sequin pumps. Her accessory set includes a pink hairdresser's gown for her client to wear, 2 large rollers, 4 small rollers, a battery operated hairdryer (batteries not included), a blow dry brush, two hair clips with red and purple bows and a scunchie made from reflective multI-coloured plastic discs. Not only this she comes with a computer disc demonstrating how to style the hair several ways. Gotz doll hair is excellent and it can be sprayed with water and curled with the rollers by air-drying overnight. The hair is long and it lends itself to lots of plaiting too. Gotz have brought out a salon chair which would be a perfect extra accessory for the little girl receiving Hannah Hairstylist. 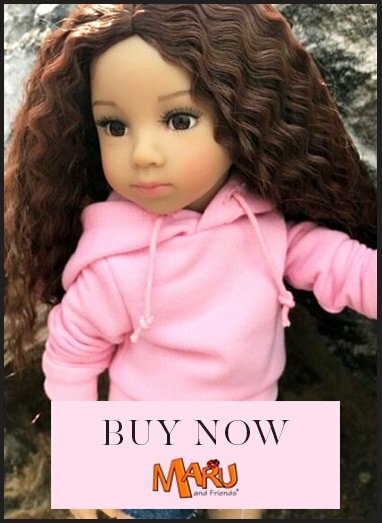 Hannah dolls are safety tested for children from age 3 but we recommend her for girls age 5 and above as her body is vinyl which makes her less cuddly than a soft bodied doll, therefore usually better for a slightly older girl. Hannah's hair can be cared for by the My Doll Best Friend brush, chosen for its detangling effectiveness whilst being gentle on the hair. Gotz's high quality, real looking rooted hair is durable enough for washing, combing and styling for years of play.